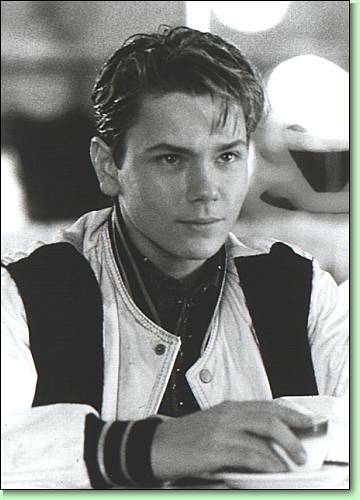 RIVER PHOENIX stars as Jimmy Reardon, a young man on the threshold of adulthood, ready for anything but too young to consider the consequences, in "A NIGHT IN THE LIFE OF JIMMY REARDON," a rambunctious comedy from Island Pictures, written and directed by William Richert. "My life has been changed dramatically over the course of a day and a half, so what happens to Jimmy is very believable to me," comments seventeen-year-old RIVER PHOENIX of the character he plays in "A Night in the Life of Jimmy Reardon." The young thespian's assertion is utterly credible when one considers that he has become a major figure in his peer group in a mere two years. Conspicuous in his debut feature, "Explorers" (1985), in which he played a young scientist, he was astonishing in "Stand By Me" (1986). His portrayal of a scruffy kid from the wrong side of the tracks stole hearts and received critical plaudits -- he was the picture's "center of gravity," said one critic. His subsequent co-starring role as Harrison Ford's son in "The Mosquito Coast" (1986) firmly established him as a very special teenager. River's background is most unusual. The eldest in a family of five, he was born in a log cabin in Madras, Oregon, where his father was moving irrigation pipes in mint fields. Arlyn and John Phoenix are Sixties-style free spirits who even today decline to send their children to public schools, preferring to take the responsibility for their education -- academic, spiritual and ethical -- at home. Their daughters, Rainbow, Summer and Liberty, and other son, Leaf, are also establishing performing careers. After the Phoenixes joined a religious organization, they lived in Mexico, Puerto Rico and Venezuela, and when they disassociated from it, the family returned to the United States, settling in Southern California. An accomplished guitarist, River broke into show business playing guitar and singing on the series "Seven Brides for Seven Brothers." Soon he was gainfully employed in other television shows such as "Celebrity," "Hotel," "It's Your Move," "Fantasy," "Family Ties," "Surviving: A Family in Crisis" and the mini-series "Robert Kennedy: The Man and his Times." Of his character in "A Night in the Life of Jimmy Reardon" he says: "He gets carried away by his dreams, which he wants to make happen in a day and a half. He took a wrong turn somewhere along the line and I wouldn't want to be like him. Still, his intentions are beautiful. He wants to go to Hawaii and live in paradise. Everybody wants that." A conscientious student from an affluent background, MEREDITH SALENGER perfectly understood her movie character -- a teenager so confident of her values that she rejects the boy she loves because of them...yet is sensitive enough to weep as she is driven away. After playing one of the orphans in "Annie," Meredith leaped to stardom in "The Journey of Natty Gann" (1984) playing a tomboyish runaway riding the rails of the Thirties. "I learned how to box and how to jump aboard a running train, and I performed many of my own stunts," she says with pride. She even made friends with the critter she traveled with, a half-wolf, half-Malamute. Her performance was honored by the Youth in Film Organization with its best actress citation. "Natty Gann" received the Gold Award at the Moscow Film Festival in the Children's Film category, the first American film so honored. Extensively trained in ballet, tap and gymnastics, Meredith has appeared in summer musical theater, including productions of "Camelot" and "South Pacific," since she was a child. Following "Natty Gann," she was under contract for a year to the Walt Disney Studios, during which time she appeared in a television film with Glenn Ford, "My Town." Her other credits include CBS's "The Last Frontier," with Linda Evans and Jason Robards, CBS's "April Morning," with Tommy Lee Jones and Robert Urich, Chanticleer Film's "The Great O'Grady" and Tri Star's "The Host," in which she starred with Joanna Pacula. Meredith expects to continue her study of acting, but she wants a college education. "My parents insist I maintain my grade levels, so I work hard. Education is a confidence builder, and makes for a well-rounded person." She is applying to Stanford, Princeton, Yale and Northwestern for the September 1988 semester. As generous as she is intelligent, Meredith happily delineates the virtues of her co-star, River Phoenix: "He's down to earth and really special." As for her director, William Richert, "He was so open, and he gave everyone so much love. I just insisted he play my father, even for a few moments, and he did."